in 4 days flat. obsession might be the correct word. handspun will do that to you. inspired by these. especially this, this, and this. [edited to add this one]. i spindle spun this bfl from gwen erin – blog here, shop here – last winter while we were at bizarre bazaar cleveland together. it has been sitting around since then, not even washed, just wound off the spindle, and waiting for the perfect pattern to come along. and i think i may have found it. citron by Hilary Smith Callis – free on knitty. size 7 needles. the ruffle is short, because i just went until i ran out of yarn (i had about a foot left!). i also bound off with a commercial wool. just needs a good blocking. even have a friend in mind to gift it too. yay!! now that citron is almost over, time to get back to working on new designs. p.s. i’m pretty certain that there will be more handspun citron’s in my future. 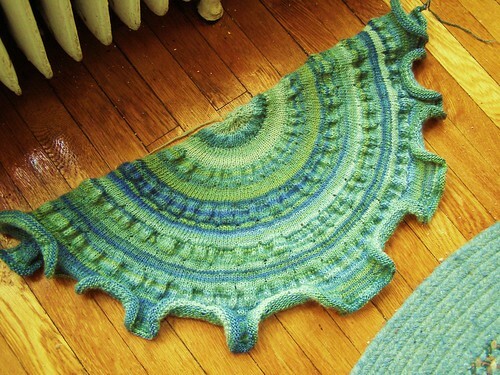 This entry was posted in cosyknitsliterally, handspun, knitting, shawls, spinning by cosymakes. Bookmark the permalink. oh MY! That is the most GORGEOUS thing!! Absolutely, positively, without a doubt, stunning! What a wonderful collaboration between you and Gwen! Seriously, Cosy, I think this is one of my favorite projects by you, for sure! Oh, Cosy, that’s just lovely. Are you bringing that Sunday? Not like I’ll get much chance to wander over, but I’d love to see this in real life. this is awesome. 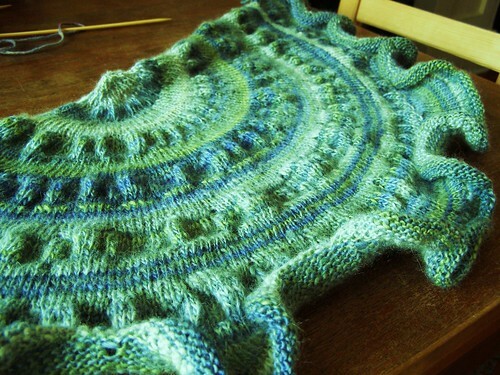 further affirmation that i NEED a handspun citron. LOVE! So pretty!! I love the yarn you chose. Beautiful!! This is the first citron I’ve seen that makes me want to knit it. Love the handspun. Wow! That looks fantastic. I remember when you spun that. Looks like you got quite a lot out of it. And the striping is so cool. It’s rather rare that I get to see a finished project made from fiber that I dyed. Beautiful work! That’s a beautiful combination. Yay for obsessive knitting! That is awesome! Beautiful color and pattern. Wish I could knit that well. thanks :) the beautiful think about handspun is that it does all the work for you :D the only thing complicated about this little shawl is that it does have a lot of stitches in the end! Awesomeness! I love the color. It will be great for Spring. Btw – did you get the pattern I sent last week? wow, nice knitted things you do!